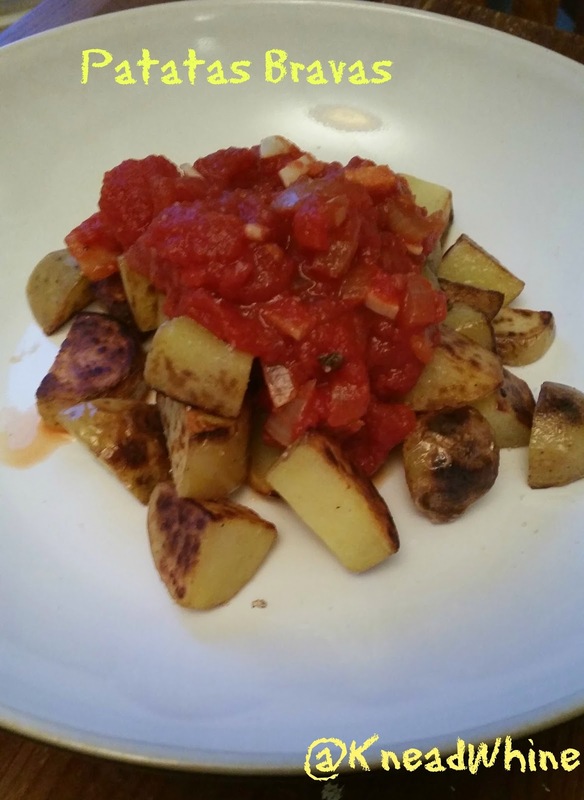 Cookbook challenge #7: Patatas Bravas from River Cottage Veg Everyday! Ooh - potatoes have featured heavily this week. Makes a nice change from pasta. This dish, from River Cottage Veg Everyday was chosen by Lindy at Squidgyboo.. and I gather it's a bit of a favourite of hers too. This week has been a good one - another two lbs off meaning that I've managed my first half stone and will treat myself with a new nail varnish. I'm pretty chuffed - it means my aim of a stone before I go back to work is well in hand - eight lbs in six weeks has to be possible, right? Veg Everyday is a great book - it's one of those rare books that I've made lots of recipes from. I love the quick chickpea curry. It's filled with recipes that have ingredients that aren't all that finicky, aren't so difficult to resource and a large collection of recipes that are easy and quick to make in the evening - which is what I need. I served this with some Goodlife bean and spinach sausages, working out at 10 propoints for the meal in total - 6 for the serving of patatas bravas and 4 for two sausages. 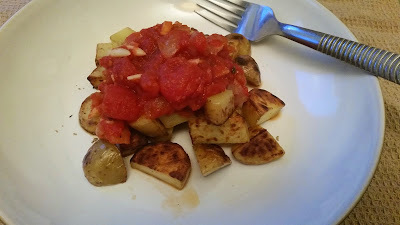 This also works well with baby-led weaning - Roo is very keen on new potatoes in sauce. It's the perfect texture and size for her to hold... and this is one of the less messy sauces as it is thicker. I can see this becoming a regular part of the weekly meal plans. Stats: - 3 servings at 6pp each. The sauce is actually 0 propoints per serving. First of all, sweat the onion with a few sprays of frylight in a large pan for five minutes. Add the thyme, garlic and chilli and sweet for a further ten minutes, until the onion is softened and the chilli released its flavour. Add the tomatoes, paprika and sugar. Bring to the boil and then simmer over a low heat for fifteen minutes, allowing the tomatoes to become thicker and a little jammy in consistency. 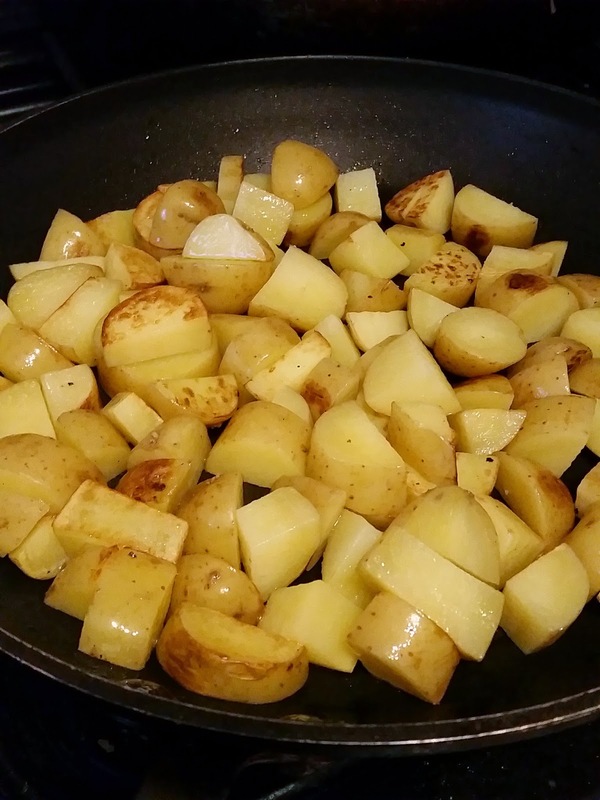 Bring a large pan of water to the boil and par-boil the potatoes. This should take about eight minutes. Drain well and rest for a few minutes to allow to dry further. Warm the oil in a frying pan and sauté the potatoes for around fifteen minutes. 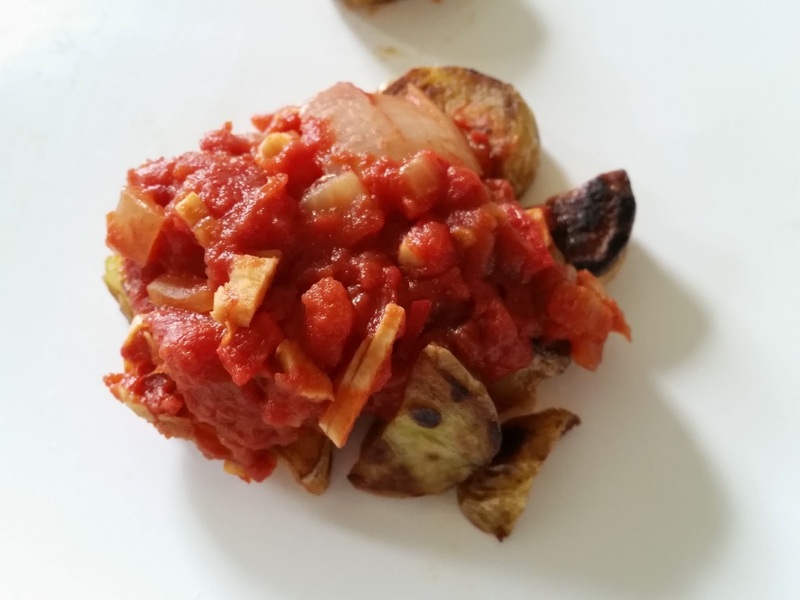 Separate the potatoes into three dishes and lay the sauce over the top. For the adults, season. For babies, hold back!